Kites are represented in the left panel by the positions of their vertices and the sides and diagonals joining the vertices. 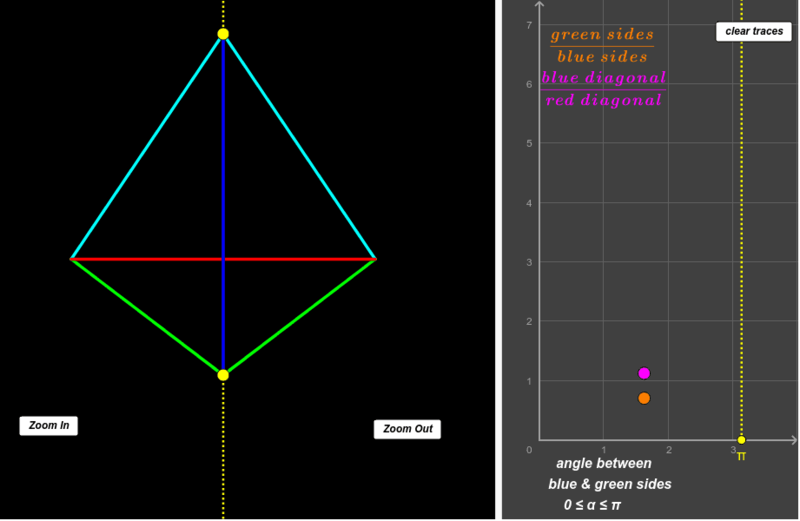 They are represented in the right panel by the points in a rectangle that has the angle between sides of the kite plotted along one axis and the ratios of side lengths and diagonal lengths plotted along the other. You can control the applet from the left panel you can drag the yellow dots to explore the space of kites as seen in the right panel. Explain how you might construct a kite from a point plotted in the right hand panel. Does every possible shape kite correspond to a point in the rectangle on the right? Does every point in the rectangle on the right correspond to a kite? Can you prove your argument? Can any shape kite be generated by the controls in the left panel? If yes, can you prove it? If no, can you give a counterexample? What problem(s) based on this applet could / would you give to your students? What have you learned from this applet?